Children’s happy voices blend with those of parents and teachers, as the preschool students at Happy Corner Parent Participation Preschool are welcomed to start their day. The children sing to greet their friends who are joining the morning circle. After their daily song, the children may continue singing, they may listen to a story, or be inspired into spontaneous activity. Then they are off – to do their most important work as children – PLAY! Founded in 1971, Happy Corner Preschool is located in the Renfrew-Collingwood community and draws children from the local neighbourhood, and also beyond in East Vancouver and into Burnaby. Happy Corner is a play-based preschool and is proud to be one of two licensed parent participation preschools in East Vancouver. 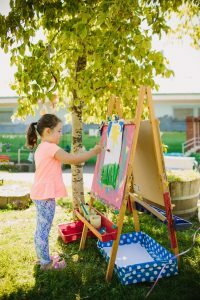 As a play-based preschool, the teachers are committed to supporting every child to reach their full potential emotionally, socially, physically and cognitively. 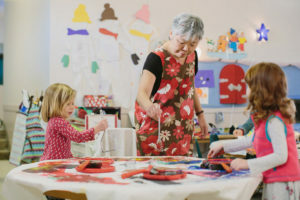 In 2016, Hisae McMichael, the teacher director at Happy Corner, received the prestigious Goldie Maycock Award for excellence in preschool teaching from the Council of Parent Participation in Preschools in BC. A typical day at Happy Corner is anything but typical! Daily activities are child-lead, and completely supported by the comprehensive play-based program developed by the experienced McMichael. Children are encouraged to enter fantasy worlds through dress-up play, create and get messy through a myriad of arts and crafts, or simply spend quiet time in a cozy reading nook. The Butterfly Garden, a whimsical outdoor area surrounding the preschool, is used daily by the children, as often as weather permits. There are also structured moments throughout the class to punctuate the children’s play and establish a sense of routine – morning circle time, communal snack time and clean up time. Parents benefit alike as part of the Happy Corner community. The preschool is proud to offer a leading-edge parent education speaker series, offered by experts in their respective fields, and is open to the public. Parents broaden their parenting skills by participating in this speaker series. Parents will soon be able to log onto an online library resource on parenting and child development to support their parenting and this resource will also be accessible by the public. Happy Corner is more than a preschool for children – it is a strong and supportive community of families, caregivers and teachers, where all are welcomed and valued and where all come together to learn and grow. To learn more about Happy Corner Preschool, please join us at our Open House on February 24, 2018. Visit us at www.happycorner.ca to view our upcoming Parent Education Speaker Series. Brooke Bennett is a transplanted Edmontonian to the west coast, who has loved living in Vancouver for the past decade. In her former life, she was a contaminated sites specialist, who left the world of consulting to stay home to raise her daughter. Her daugther attends Happy Corner Preschool. Brooke enjoys learning along with children.